If you went on YouTube this morning and felt something was amiss but couldn’t quite put your finger on it, you were not alone. The company made several changes to the user interface (UI) for the desktop and mobile platforms, along with a redesigned logo. The logo change is the first for YouTube, and it represent the shift that has taken place in our viewing habits since the site was launched 12 years ago. The screen with the play button has moved to the left, signifying a flexible design for the many different devices now available in the marketplace. More importantly, the company also recognizes the creators who have made YouTube an industry in itself. So the changes are going to improve the way creators and viewers interact on YouTube. The changes to mobile begin with a clean new design and more control of what is being watched. For creators such as small businesses, it includes a feature that changes shape to match the video format, such as vertical, square or horizontal when users watch it. This means less time in post-production time spent on reformatting videos. Additional mobile updates include videos that move with you, being able to watch at your own pace, and browse and discover videos while you watch. The changes to the desktop also include some of the mobile UI improvements. A feature called Dark Theme delivers a cinematic look by turning the background dark while you watch a video. 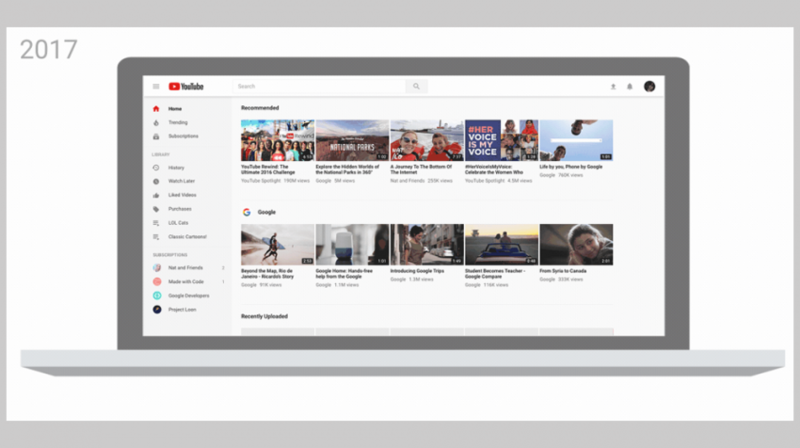 YouTube is making changes, but addressing the UI first highlights the company’s desire to make consuming videos much easier. As Facebook Video continues to capture more of the market, YouTube’s dominance will not be as strong. For small businesses that rely on video to engage with their customers, it will mean using YouTube and Facebook, as well any other platform as long as it delivers results.